I have The Even More Complete Book of Australian Verse CD. When I played it I had a milk (or it may have been rough red or Stone's Green Ginger Wine) exploding out of my nose experience. one - even if we have to acknowledge his shaky isles heritage. oh yes yes. I have loved him since Fred Dagg and envy your meeting him. saw him and Dawes onstage once, just conversing, and they had bottles of red wine and we had a wonderful time. thanks for the revelation of Auden, new to me. Now wondering why more babes are not named Wystan. Funny place NZ, producing Fay Weldon and John Clarke and that smart PM and the woman one and Split Enz. Kiwi, Van der Hum, Solvit, Ethereal etc and the cream of the crop, Sunline. Cut off the bookies telephones ..
Ann, why is it funny that NZ 'produced' all those people? Would you think it was funny if they came from an Australian state? "Funny, Victoria producing..." doesn't have quite the same ring, does it? NZ being a such a presumed backwater, I suppose. Or maybe I'm missing something...? My John Clarke story is that I saw his very first public performance(s) in the Victoria University Review of (I think) 1971). It was a sketch-type show, and he was in a lot of the sketches, many with Roger Hall who was later to become NZ's foremost playwright of middle-class angst. That revue was the first time that Fred Dagg ever appeared, and I saw it three times (twice with comp tickets), and could once recite great slabs of it. Annie is sick to death of people who read authors in 3 different languages and have ferkn doctorates, slagging her off every time she makes an innocuous remark on one of these damn alpha-blogs. perhaps if she had thought for one second and put 'fabulous' instead of funny, but then she does not spend hours doing 9 drafts of a blog comment before clicking Publish. She has read every word that Weldon has written, and Auto da Fay. She never says nasty stuff in her comments, unlike so many of you. She nearly moved to NZ when they had PM Lange with a brain, and Helen Clark. rack off hairy legs and I hope you read this before Dr Pav deletes it. He posted a link to this on twitter, in relation to some golfing shots. But suspect with titles like 'dem boids' and 'where's wally' that these might be his photos and they are bloody good un's too. I was once manning a stall in Leura at their annual fair and the only person I saw all day who I recognised was John Clarke. He approached the stall picked up a mbira and asked me what it was. It's hard not to say mbira without stuttering a bit on the 'm' and he totally took the piss out of me mimicking back my pronunciation. m m m mbira. It was delightful a complete hoot. He used to have an office near (above?) the Australian print workshop on Gertrude st, (or is it Johnston..?....damn, it's too long since I had a weekend free to wander around Melbourne), and he wandered in one day when I was talking to the head printmaker there, "anyone for a coffee?" was all he said, and I wished I'd had the courage and cheek to say yes. He seemed to be quite interested in visual art too. Errr... I read and speak only in English and don't have a doctorate, but I will own up to the hairy legs. I didn't intend to slag anyone off and I'm sorry if you were offended by my question, Ann; I just didn't understand (and I still don't, to be honest), why it is considered 'funny' that a few famous people lived in NZ in their childhood. There are others, of course - Stephanie Dowrick is one who springs immediately to my mind - but there are really very few kiwis have 'taken their place on the world stage'. Compared, for example, with Ireland, which has a similar population, there are almost none. 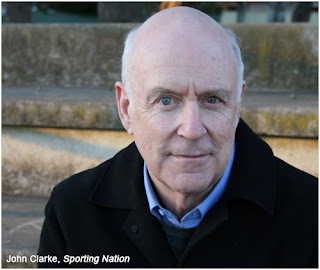 I think Mister John Clarke has been Pavdotted - his server is unavailable tonight. Well done - at least he is still tweeting!